Our Destination today is the southern craters of the highest volcano in Europe and the nice city of Catania. You will see some typical towns like Santa Venerina, Zafferana Etnea. 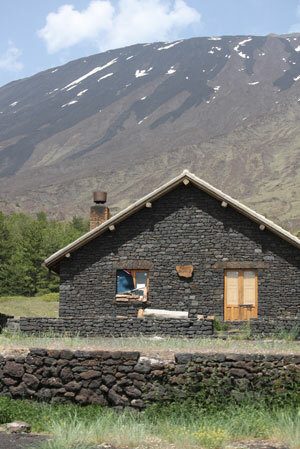 After one hour you will reach the “Silvestri Craters” located at 1850 meters. Possibility of nice walks on the cold lava rivers from the last three years. Eventually, you can purchase an optional trip to get almost to the top of the volcano (3000 mts): first you will take the cable-car up to 2600 meters, then you will board all-terrain vehicles that will take you to the foot of the main mouths. We will then drive you to the beautiful town of Catania and we will visit the main monuments of the city the Cathedral, the Badia of Saint Agatha, the Church of Collegiata, Palazzo Biscari, the Roman Theatre, the Roman Anphitheatre, The Ursino Castle, Via Crociferi, Villa Bellini, "la Pescheria". Catania is Sicily’s second largest town, with a population of 400.000 people. 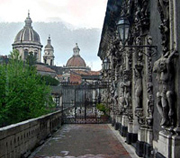 Known as the Milan of the South, Catania is the financial and economical centre of the island. It was founded in 729BC by the Greeks, at the foot of the famous volcano Mount Etna. The fate of the city has always been linked to the presence of it. As a matter of fact, the history of Catania is marked by a long succession of disasters, most of them depending on the volcanic activity and eruptions of Mount Etna. The most famous of most recent eruptions took place in 1669 when a cleft opened from the crater right down to Nicolosi and out poured a river of lava that spread over a kilometre into the Ionian sea, devastating everything in its path and killing 20.000 people. In the 18th and 19th century have been recorded about 30 other eruptions. In May 1923, a terrible fracture out poured lava almost until the town of Linguaglossa. On November 1928, during the most deadly eruption of the century, two cascades of fire shot up from a deep cleft in the mountain and destroyed the town of Mascali, and also interrupted the railway from Catania to Messina. In 1983 Etna has been declared a “Regional Park”, a protected mountain and it has been divided into three different zones: the lower slopes are under cultivation, those just above are wooded and the uppermost are desert. Typical crops are: lemons, oranges, cherries, pistachios, and wine grapes. A volcanic vegetation is also protected: tree spurge, a local variety of milk-vetch, wild violet, and groundsel. In the woods you can see broom, chestnut, birch, beech, pine and oak trees. Wild animals also live and are protected in the area: porcupine, fox, wild cat, weasel, marten, dormouse, woodpecker, kestrel, buzzard and few reptiles like the asp viper.